A while back I picked up a four-pack of frozen tuna steaks at Food Basics for about $10.00, which is a really reasonable price around here. Now, I know that frozen fish can be hit or miss, but around here a lot of the stuff you find at the fish counter is previously frozen anyway (it’s usually noted only in the tiniest of print), so I figured I’d give it a shot. I followed Jamie Oliver’s tutorial for How to Cook Tuna Steak, which I’ve had great success with before. I figured it would be a good idea to keep the methodology the same if I wanted to test a different product, only changing the one variable and all that. See, teachers, I did learn something in science class! The rub on the tuna is salt, pepper, coriander seeds, and fennel seeds, all ground together with a mortar and pestle. 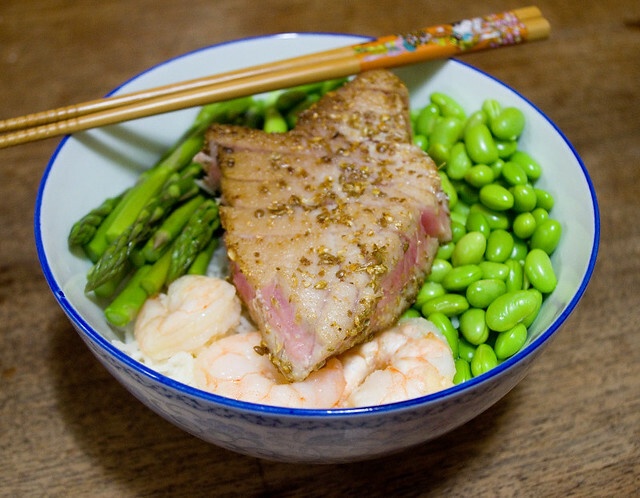 I served the fish over sticky rice, along with garlic shrimp, steamed asparagus, and steamed edamame. Overall it was a lovely, fresh-tasting dinner, and I look forward to having it again.